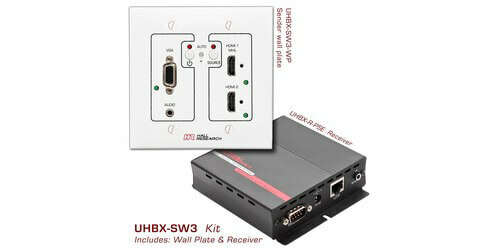 The Hall Research UHBX-SW3 is a kit that consists of a multi-format auto switching 4K UHD wall plate and an HDBaseT receiver. 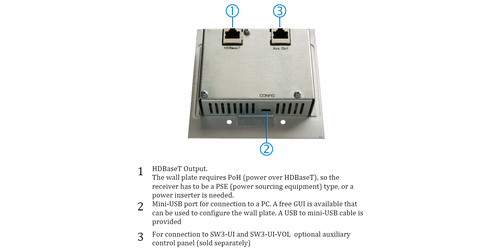 The wall plate features 2 HDMI, 1 VGA, and 1 audio input, and then outputs all these over a single Cat6 cable over HDBaseT to the included receiver. The signal can be sent up to 330' for 4K resolutions and up to 500' for 1080P resolutions. 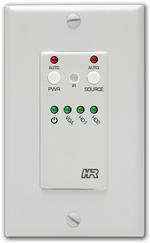 Not only does the wall plate detect the last plugged in signal on the wall plate and automatically switch but it also has a source button that allows for quick manual input selections. 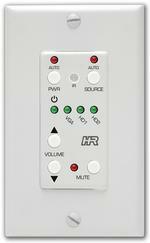 Another special feature on the wall plate is it has RS-232, CEC, and IR capabilities allowing you to power on and off your TV with a power button on the wall plate, or you can also set it to automatic mode where the RS-232 commands are sent to power on the TV when a signal is detected. 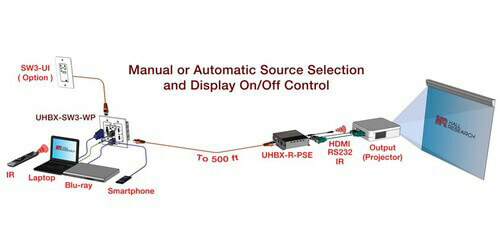 The TV will power off automatically when the signal is lost after your desired set delay. 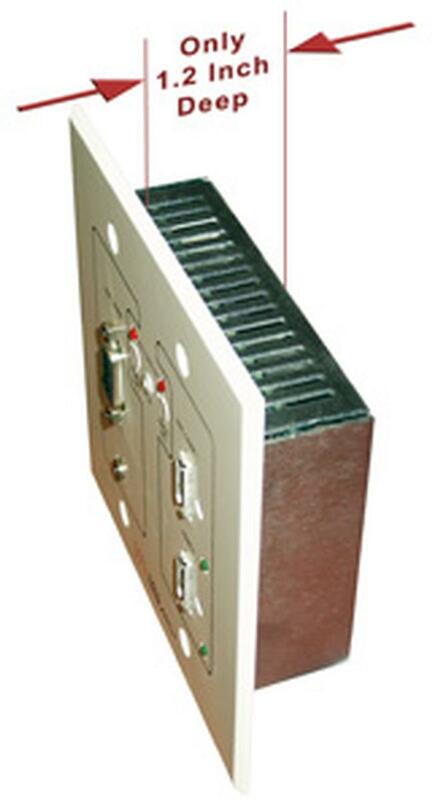 The receiver featured PoH as well so it will supply power to the wall plate so no local power supply is needed for the wall plate. When the VGA is detected it will automatically scale to 1080P or whatever resolution you choose, the audio is embedded over the Cat6 cable as well. 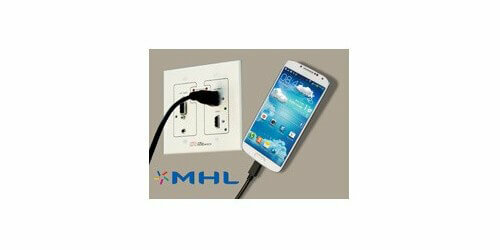 The HDMI input number 1 supports MHL with phone charging which allows users to present from their phone with just a cable. 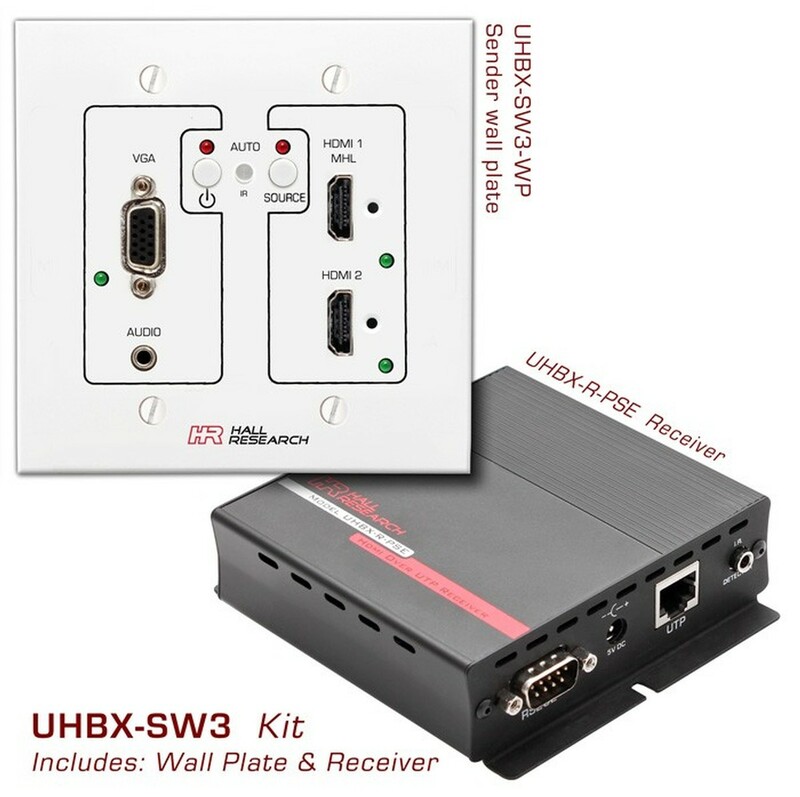 There is a USB port that allows full easy to use drag and drop programming of the UHBX-SW3 wall plate, take full control of all the capabilities quickly and easily making set up a breeze. 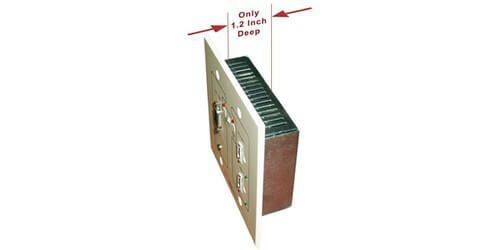 This kit is ideal for conference rooms, classrooms, or anywhere you need high quality presentation. 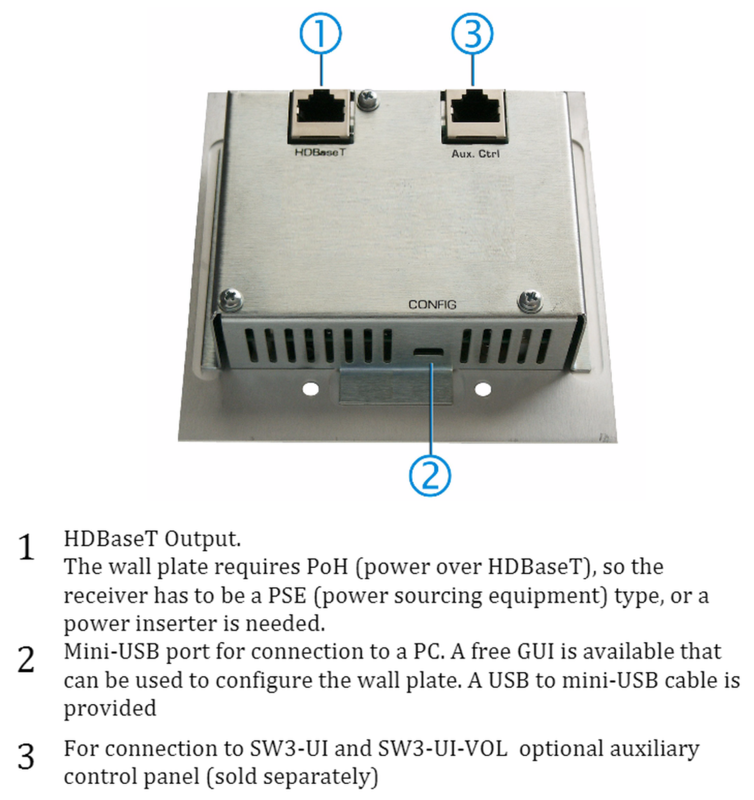 Connect to the optionally purchased SW3-UI or SW3-UI-VOL wall plates for remote control of your wall plate, the SW3-UI-VOL adds volume up and down as well as muting. 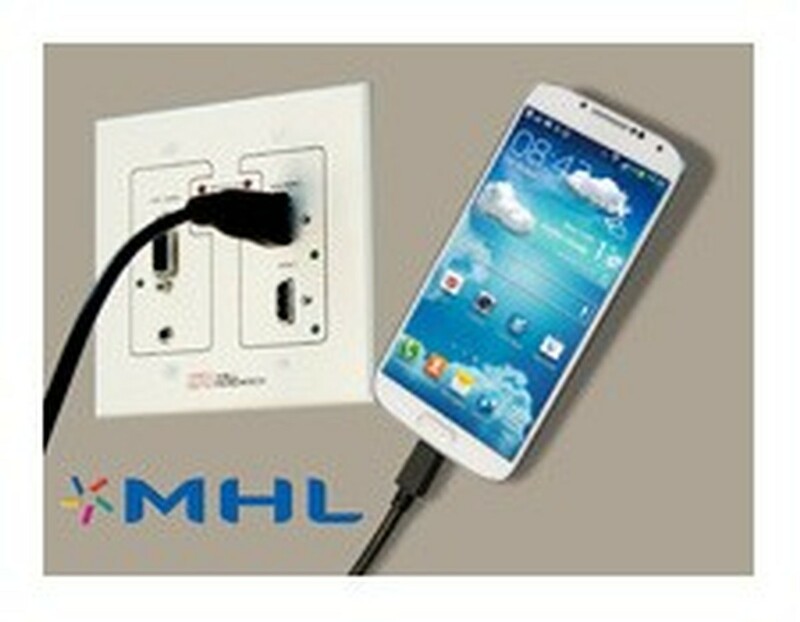 Now you can control your wall plate from up to 200' away in the room by simply connecting a Cat5 cable to the aux input on the back of the wall plate. Excellent little switchplate. The software gui allows for a TON of advanced features not seen anywhere else. Having a programmable interface, along with a separate auxiliary keypad for additional control gives this box a serious leg up on the competition, and removes the need for multiple, cludge-y boxes to achieve the same result. Don't let its size fool you!